Justice Minister emphasizes that PM was the one who removed from the cabinet agenda the vote to officially approve Havat Gilad. 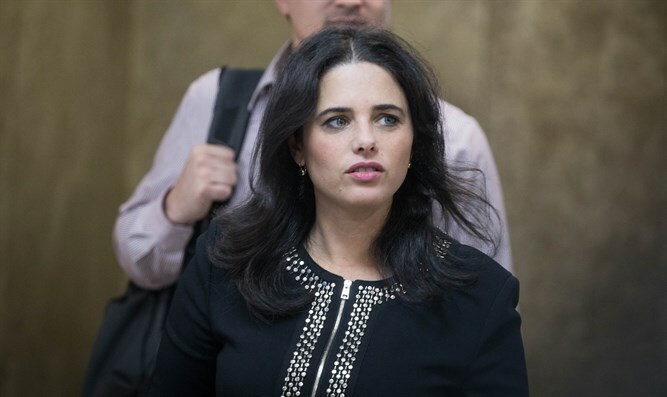 Justice Minister Ayelet Shaked, speaking on Army Radio this morning, criticized the conduct of Prime Minister Binyamin Netanyahu for his failure to put on today’s cabinet agenda a bill that would grant official approval to the Samaria Community of Havat Gilad. Havat Gilad was founded 15 years ago, on land legally purchased and privately owned by Moshe Zar, but did not obtain official Interior Ministry recognition as a Judea and Samaria community and therefore the government does not invest in it. Following the murder, Defense Minister Avigdor Liberman (Yisrael Beytenu) ordered the ministry to investigate the possibility of normalizing the community’s status and establishing it as a recognized township within the Samaria Regional Council. Ministers Naftali Bennett and Ayelet Shaked (Jewish Home) said on Wednesday they expect the government to decide on Sunday to normalize the status of the community of Havat Gilad in Samaria. "The Attorney General approved the proposal of the decision makers regarding the normalization of Havat Gilad, and there is no legal impediment to bringing it up for discussion," the ministers said. On Thursday morning, the chairman of the Jewish home, Minister of Education Naftali Bennett, issued a call to the prime minister to raise the proposal at the upcoming meeting. "I expect Prime Minister Netanyahu to bring up the normalization of Havat Gilad this Sunday," Bennett demanded. "The time for excuses is over."